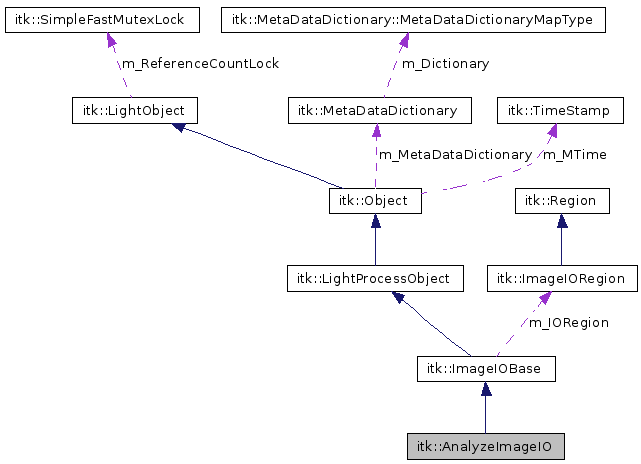 Class that defines how to read Analyze file format. Analyze IMAGE FILE FORMAT - As much information as I can determine from the Medical image formats web site, and the Analyze75.pdf file provided from the Mayo clinic. A special note of thanks to Dennis P. Hanson (dph@mayo.edu) for his generous contributions in getting this information correct. 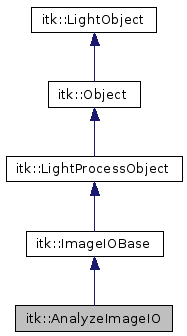 an object file ([basename].obj) A specially formated file with a mapping between object name and image code used to associate image voxel locations with a label. This file is run length encoded to save disk storage. Definition at line 93 of file itkAnalyzeImageIO.h. Definition at line 99 of file itkAnalyzeImageIO.h. Definition at line 97 of file itkAnalyzeImageIO.h. Definition at line 98 of file itkAnalyzeImageIO.h.